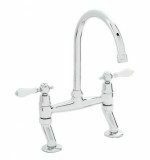 The Carron Phoenix Atholl 2 Hole Kitchen Taps (Bridge Mixer Kitchen Tap) by Carron Phoenix, has traditional capstan handles (cross head handles), an elegant swan neck spout and comes with adjustable feet. 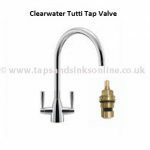 This is a style tap that goes wonderfully with a Carron Phoenix Belfast Sink or any other undermount sink where the kitchen design is based on a traditonal or cottage style design. 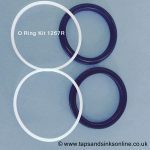 The adjustable feet are useful where the tap is being fitted into pre-cut holes in the sink or existing worktop holes. Budget should always be your starting point as there are such a wide range of Kitchen Taps available within all price ranges. 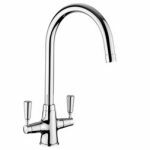 The Carron Phoenix Atholl 2 Hole Kitchen Taps offers the most value in our mid range kitchen taps at the very competitive price including VAT. But if this is beyond the scope of your budget then consider The Riviera Range of Taps by San Marco, which provides 3 different styles at budget prices: Riviera Deckmixer 2 Tap Hole Kitchen Tap, Riviera Lever Tap and the Riviera Palazzo Tap with comes with side levers for ease of use. The Carron Phoenix Atholl 2 Hole Kitchen Taps is the best option if you have low water pressure in the hot water side of your Kitchen Tap as it uses a compression valve (twist turn valve). Lever styled 2 Hole Kitchen Taps, e.g. 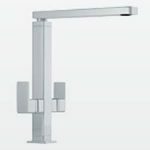 the Carron Phoenix Barra Bridge Mixer Tap, uses ¼ turn valves which require higher water pressure. The Carron Phoenix Atholl 2 Hole Kitchen Taps uses traditional capstan / cross head handles that you twist to turn on or off. Consider a bridge mixer tap with Levers if you want an easier tap to turn on / off e.g. Carron Phoenix Barra Bridge Mixer Tap with ceramic levers or the San Marco Riviera Lever Tap. Atholl and the Barra taps are only available in Chrome. If you want to match up other features in your kitchen e.g. door handles, cooker hoods, fridges etc, then you might want to choose a bridge mixer tap in another colour if these are not chrome. The San Marco Tuscany Bridge Mixer Taps offers other colour / finish choices: Bronze, Brushed Nickel and Chrome. The Atholl tap has the popular swan neck spout. 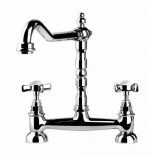 If you want to make a statement by firmly placing your tap in the very traditional style, then consider the The San Marco Tuscany Bridge Mixer Taps with it’s very decorative spout that harks back to bygone eras. Want to buy Atholl tap now? Simply click on the button below and you’ll find it in your shopping cart!